The Missy collection from Volume Apparel features a variety of clothing for women of all ages. High quality and wholesale prices come together in this selection of tops, bottoms and dresses from well-known designers. These are the pieces that women are searching for, and they have been hand selected for their ability to sell. 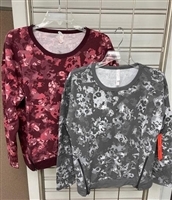 Volume Apparel offers some of the best prices on wholesale ladies fashion clothing whether you buy a single 12-piece packet, a pallet or an entire truckload of merchandise. Famous Brand ladies cold shoulder short sleeve top. Famous Brand ladies long sleeve top. Famous Mall Store ladies drape neck top. Famous Mall Store sleeveless V neck dress. Famous Brand ladies V neck dress. Famous Mall Store ladies V neck stripe dress. L Levine ladies cross tie front top. Famous Mall Store ladies french terry dress. Famous Mall Store ladies french terry romper. Olivia Sky ladies tunic lace top. Famous Brand ladies rib mock neck dress. Famous Plus Store ladies lace up short sleeve top. Olivia Sky ladies tunic lace up top. Famous Brand ladies rib sleeveless turtleneck dress. There’s good reason why Volume Apparel is the missy collection supplier of choice for retailers across the world. While some wholesalers focus on nothing more than offering the lowest price, we put additional emphasis on quality and customer service. Same Day Shipping Available – When you need your shipment of wholesale ladies fashion clothing fast Volume Apparel is the place to shop. Our warehouses are always well stocked so there is no waiting on back orders, and if you place your order before 12pm eastern you’ll get same day shipping! Solid Customer Service – Volume Apparel has grown year after year because we put our clients first. We’re available to help by phone or email when you have questions or need help placing an order. Give us a call today at 1-800-933-9668 to learn more about ordering wholesale ladies apparel online at Volume Apparel.